Google released its Android platform a few months ago but it wasn't untill last week that you could actually get your hands on an Android phone in the Netherlands. Telecom provider T-Mobile, who also has the exclusive rights to Apple's iPhone in the Netherlands is the first provider to put the G1 on the shelves in Q1 this year. Aside from its slick looks, one of the driving forces behind the iPhone success has been the option to create applications yourself and no doubt this will even be more true for the Droid as Android will be an Open Source platform. Marketing Director Bart Weijermans of T-Mobile Netherlands said that the Android will be a force to be reckoned with on the mobile market because it is widely supported by the Open Handset Alliance, which can boast a host of Telecom providers. Last one to join the alliance was Vodafone early December 2008. Small wonder T-Mobile launched last week with a Developers party in the 'De Zwijger ' warehouse in Amsterdam. About 250 software developers and companies were present at the afternoon session which lasted untill way past bedtime. To spice up the launch of the Android, T-Mobile organised a development contest. Untill january 26 developers can submit applications to Android DevCamp and win a trip to San Francisco. The winning entry also receives the opportunity to ride along with the national Android marketing campaign of T-Mobile. 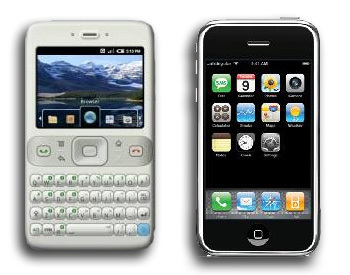 Just like development of Native Applications for the iPhone, the main skill required to fiddle with the Droid is Java. To get started download the Android SDK here. Sometime Mid 2007, at the height of the hype, we saw a number of telecom providers digging into Second Life. Now, these first wave pioneers are slowly moving away, such as Vodafone. Others still have got no clue as what to do in Second Life. When I talked to someone from KPN earlier this year, they were in Second Life, fiddled around, explored a bit, but couldn't find any real use yet. However, what they did do was setup a messaging center that could send SMS from SL to RL. So, I was kind of surprised when I learned British Telecom ran a trial with inworld-outworld communications, a trialperiod which just ended though. They set up a splashing website called BT AvaTalk. 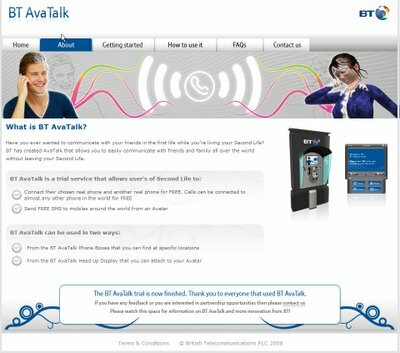 Where can I find the BT AvaTalk Phone Box? The movie below provides full details into a service that we cant quiteunderstand - sure the main pull is that its free, but take away the free aspect and why would you ever want to call someone in the 'real world' from Second Life rather than just use a 'real' phone on your desk or a service such as Skype? We tend to get a bit of flack at times for using Second Life in our research, but we fully believe that there is a strong argument for these collaborative environments in the realm of geographic and architectural visualisation. However, we still cant see why we would want to pick up the phone in Second Life to ring someone, as we obviously are not actually in the environment. I wouldn't be that sceptic either. I think it is a road we must pursue, even if it has no immediate use. Eventually it is about fast changing ways of communication. Who would have predicted we would stream microblogs to our mobile phone a few years ago? If we do move to a world like Second Life to do real business meetings calling in and out to the Real World might be very usefull for the ones left behind in a Traffic Jam, or could not be present for any other reason. For now, it's TTYL (talk to you later) though, and I'll pick Orange as the most successful telecom provider in Second Life. There is activity there, for instance with the currently running Innovation Week. In the past year and a half I've been exploring Second Life, mostly seeking out corporate sites. Most of these had maginificent builds, some were utterly disappointing. The general consensus though has been that no matter how beutiful the build, most of the companies haven't got a clue of what to do with a virtual world yet. They have been marketing showcases for most, and a lot of these have already withdrawn from Second Life, such as Vodaphone, Pontiac / Motorati, Mercedes, ING and Wells Fargo, to name but a few. A number of these companies have withdrawn from virtual worlds completely, quite a number have moved on to a more private world as they figured their customers needed some privacy. Which have had private islands, but no report exists on what they have been doing out there. The general idea is that thse companies have made it to Second Life and have explored the possibilities for inworld training and conferencing. 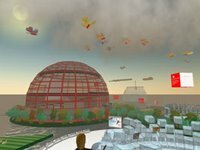 "Second Life and its public nature make it a wonderful place to let people explore the potential of virtual worlds and human interaction there, which then leads to them understanding how they might apply the principles to inside or outside their enterprise. The need for privacy, the need to grow and understand, the need for a company to still act as a tribe of some sort if a common pattern. When we started Eightbar back in 2006 it was with a private" island. It let my IBM colleagues join a public space but feel a bit of safety to experiement. That very quickly led to the need to have real privacy, internal virtual worlds as people very soon understood that they could communicate and gain value from avatar based meetings in virtual worlds over and above telecons and emails and even instant messaging. Understanding these approaches will only help once people have experienced a connection of some sort at a personal level. Then the business ideas will flow. It still wont be for everyone, but most people are visual, and we live in a 3d space. We communicate non-verbally, sit next to people we know in RL and in virtual environments. Ignoring that and filtering it with telecons and IM is clearly restricing our potential. A little more about this is on Eightbar.com"
If you know more about these companies and what they have done in the Virtual World, would you please let us know what your experiences have been? Rivers Run Red was the world's first agency to establish a working presence within a virtual world. 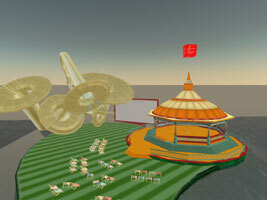 RRR has been active in Second Life since 2003. In meatspace the company has offices in London and San Fran. Projects include Vodafone, Philips, ING, Reebok, Adidas, Calvin Klein (CKin2U), Heineken, BBC, Channel 4, Penguin, Duran Duran and Radio 538. It's surprising to see how many Dutch client the company has. Since 2007 the RRR faces serious competition with new native Dutch virtual builders such as [lost in the] Magic Forest, Damanicorp and SLionhead. Aside from their corporate website RRR runs the Space Think Dream thingy as an extra outlet of their works. Early february the Vodafone sim went online, shortly before I opened this blog. Now, two months later I noticed that Vodafone was still missing. The sims is built around the Vodafone logo, but to much Alice in Wonderland style in my opinion. An auditorium, an info center and a goodiecorner are the standard ingredients, but the sim leaves room for visitors to stick some pictures to the wall of an iglo. With giant drums, horns and a circus act skyhigh-dive-into-a-small-bucket I certainly have to say that Vodafone has an original design, but it doesn't invite me to come back either. Rivers Run Red are the producers of this sim.